Peter Friedman. Photo by Joan Marcus. 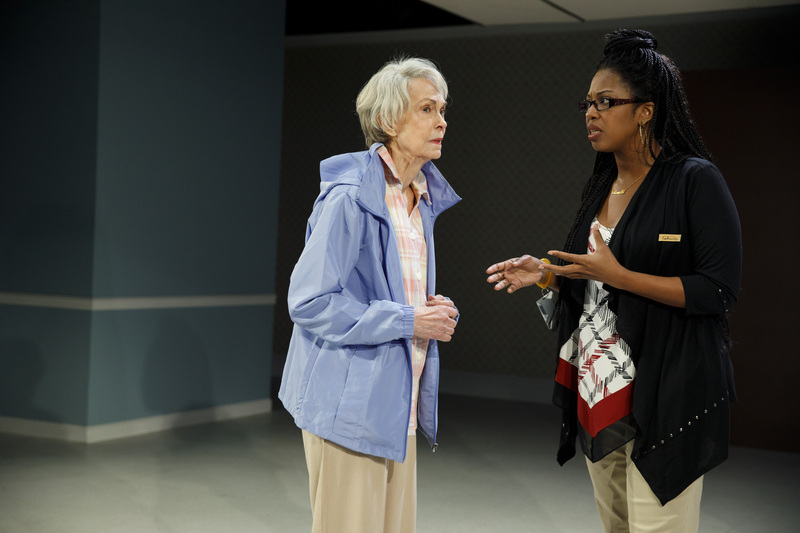 Downstairs on the main stage at Playwrights Horizons, there is a beautiful and complicated play that is stemmed from the love of a mother, and revolves around the death of a father. The children have come to the death bed of their father, surrounding him with love and devotion. Sarah Ruhl, the playwright of For Peter Pan on Her 70th Birthday obviously cares just as deeply for her mother, writing her into this play, and her her lovingly portrayed by the magnificent Kathleen Chalfant. The play was written as an ode to her high flying days and their strong emotional connection. And from what is on display in Max Posner’s The Treasurer, upstairs from For Peter Pan.., this playwright has done something similar, with a lot more humor, but from a very unique angle and with a very different outcome. Deanna Dunagan, Peter Friedman. Photo by Joan Marcus. 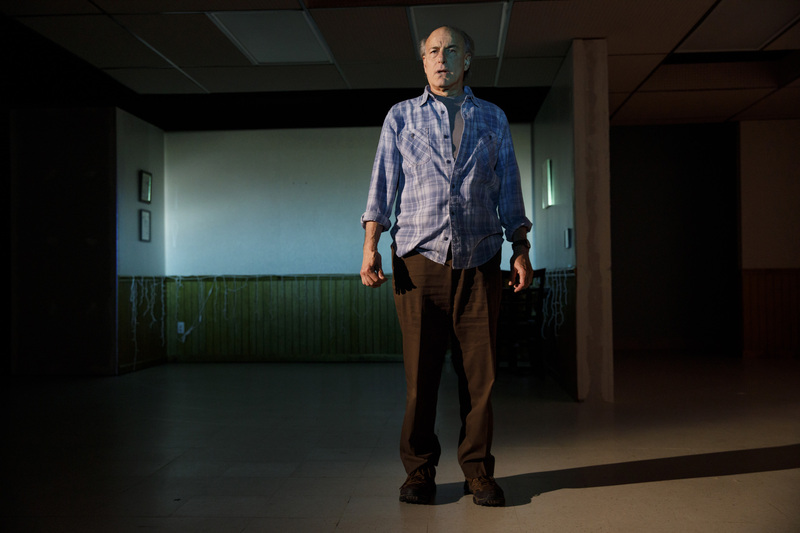 It all starts out with a man, ‘The Son’ as he is referred to in the program, played with an exacting attention to emotional detail by the incredible witty Peter Friedman (The Public Theater’s Hamlet), explaining himself to us from center stage. He tells us quite matter of fact-ly, that his son has asked him if he could write a play about him, which he doesn’t quite understand. He doesn’t feel he has much to offer dramatically, being the type of man that he is, but he is wrong. His son, the playwright, wants to write not just about his father, but his father as a ‘Son’ who has a very difficult and stressful relationship with his aging mother. This is not going to be a pretty mother’s day card, like Ruhl’s play is. The ‘Son’ makes that perfectly clear. 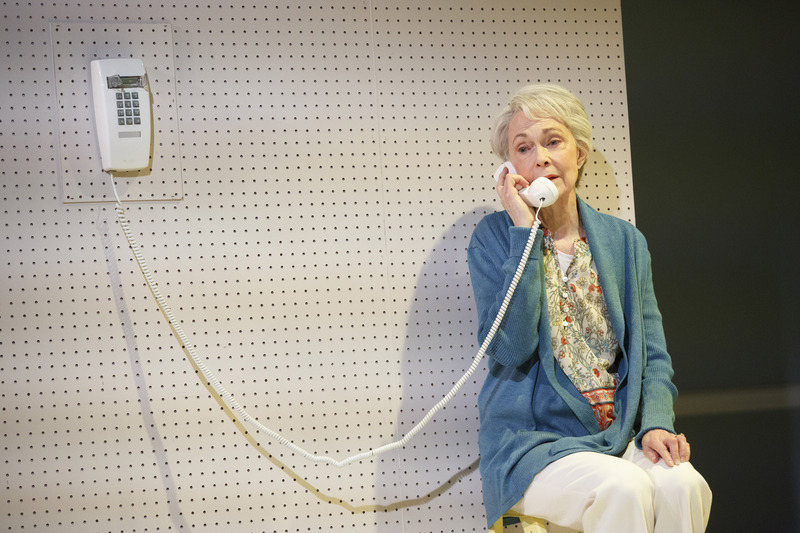 The obvious love of the playwright’s father is solid and clear, while the ‘Son’ and his mother’s connection is far from rosy. The Treasurer is an engaging new play, wickedly funny and surprisingly surreal, that focuses on a man dealing with an aging parent, his mother, with whom he doesn’t have quite the typical nor loving bond with. For many reasons, he tells us, in clear and unique fashion. And within the first few minutes of this intricate and powerful piece of theatrical writing, crazily funny and whip-smart, we are instantly on his side. Deanna Dunagan. Photo by Joan Marcus. Directed by the always impressive David Cromer (2ST’s Man from Nebraska), the fluidness of the story telling feels entrancing. The ‘Son’, engaging in conversations with his siblings, comes up with a plan to deal with their distant and difficult mother when her husband, their stepfather, dies and leaves her without much of a financial plan or future. He becomes The Treasurer of her life, in essence, trying to manage the spending of a woman who doesn’t want to understand her predicament, nor really care much about it either. Skillfully played by Deanna Dunagan (Broadway’s August: Osage Country), she lives in a blur of entitlement and haute naiveté, baffling her children and complicating their attachment to her. Mirinda Anderson (PH’s A Life) and Pun Bandhu (The Public Theater’s Plenty) wonderfully play the two other siblings, Allen and Jeremy, and a host of other characters that come into contact with the Son’s Mother. It’s seamless and fluid, keeping us thoroughly engaged at every turn regardless of how uncomfortable, sad, and funny it all is, and it’s usually all three at the same moments. Deanna Dunagan, Pun Bandhu. Photo by Joan Marcus. 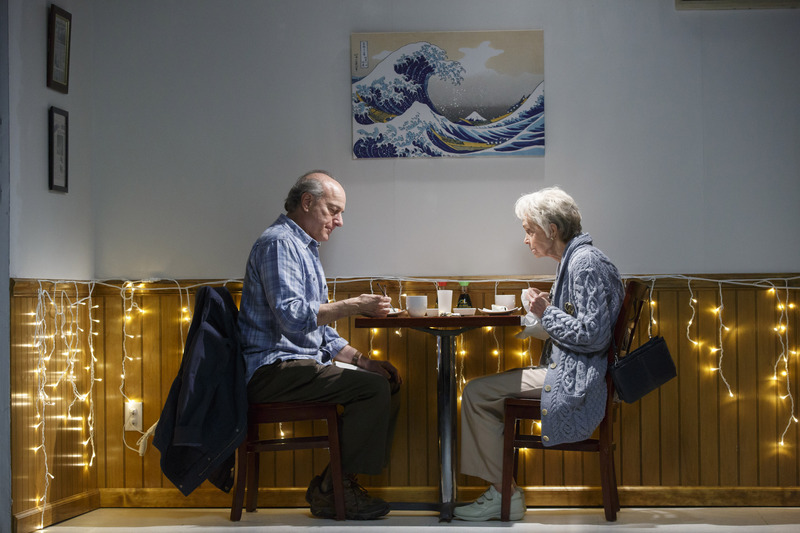 Like another play, A Life, presented last year at Playwrights Horizons, death is an exploratory adventure of surreal landscapes and scenarios. In The Treasurer, this is beautifully epitomized by the creative design team of Laura Jellinek, set (PH’s The Light Years), with costumes by David Hyman (Primary Stage’s upcoming The Gospel According to…Discord). 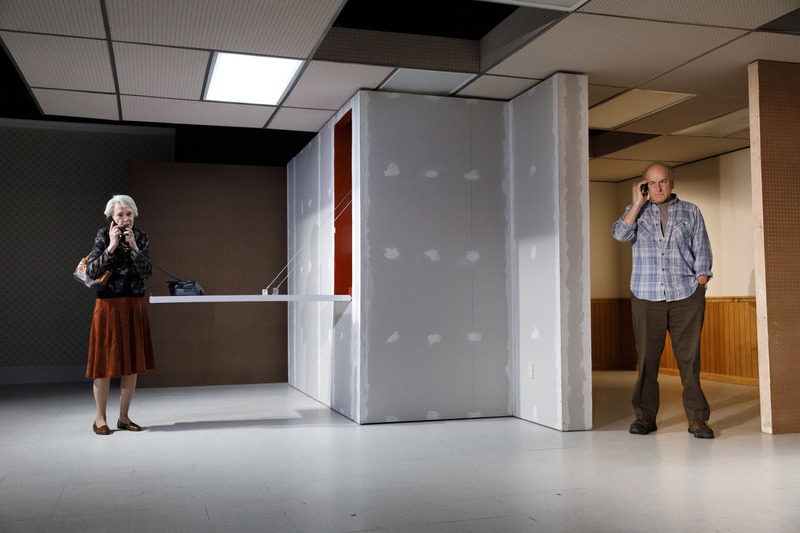 The set simmers in a deconstructed atmosphere that feels like dementia materialized in form. Lighting designer Bradley King (Atlantic’s Animal) has done an exceptional job detailing different locations and moods with his differing light tones and hues of color, particularly noticeable in the devastatingly awkward scene when the mother and son find themselves sitting in an Asian restaurant trying to converse over dinner in the best way they know how. Mikhail Fiksel (The Flea’s Fulfillment) also out does himself with the sound design, most notable with the tones and sounds of the many cellphone conversations. The design elements all seamlessly entwine to give us a magnificently clear vantage point to witness the crumbling aspects of parental attachment and care, that is complicated by dementia and a history of disconnection. Deanna Dunagan, Marinda Anderson. Photo by Joan Marcus. Anyone who is getting to the age when we begin to visualize a future where we might have to take some personal responsibility for the care of our parents can totally connect to the confusion and frustration of this re-engagement. This is especially true for those that have a more difficult or disconnected bond with their father or mother. The surreal world this play takes us down is both funny and intense. We watch the ‘Son’, the man that we have all grown quite attached to, descend into a hell created by his own guilt and shame. As he descends deeper and deeper, we feel for him and the family around him, and although his mother is by no means a villain in this drama, this is no Hallmark Mother’s Day card either. 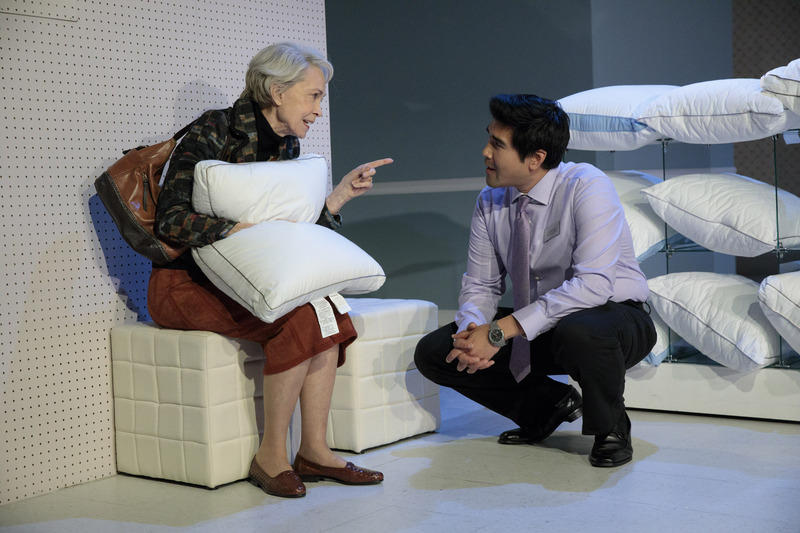 Posner has written a very funny and honest play about the complications of an imperfect mother/son relationship and what is possibly in store for us all, one way or another. Just don’t take your mother to see this for her birthday. She might never look at you the same way again. Peter Friedman, Deanna Dunagan. Photo by Joan Marcus. Previous A Clockwork Orange: Inciting Sexual Excitiment, But Luckily, No Violence. Next Breeders: An Eye for an Eye, and a Toe to Be Licked. That’s Parenthood.